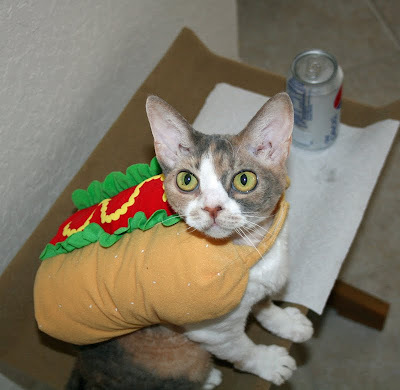 Daisy the Curly Cat: Hot Dog! Now THIS is an outfit I can model with relish! Sorry, I promised Harley I would tell that joke. Oh, Mommeh, don't forget the fries please! No fries?!?!?! I will still model. But I will not enjoy it as much. Do you want to just eat me all up? HARLEY! Stay away from the hotdog suit! We think it's grossly unfair that you don't get fries, Daisy! You do look very cute in that outfit, indeed good enough to eat!!! oh Daisy, you are a doll, and your mommy very creative, this hot dog costume is adorable!I think it's time for a Friday Party, and we could play all together in that box, it's funny! Did your Mommy make this costume for you? It's brilliant! You're all set for Hallowe'en I'd say! Mystery Meat? Oh, no! You are of course good enough to eat, but Daisy darling, have they run out all of the pretty, fancy dresses for you to model? And all of the smart accessories? Perhaps you should start your own designer house - Daisy's Designs! Nom nom nom! Eat you up! Harley is just checking out your buns, Daisy. Love the hotdog suit. You should go to a ball game. You'd be very popular. HOT DOG! You are one Cool Cat, Daisy!! Aww you are adorable Daisy. 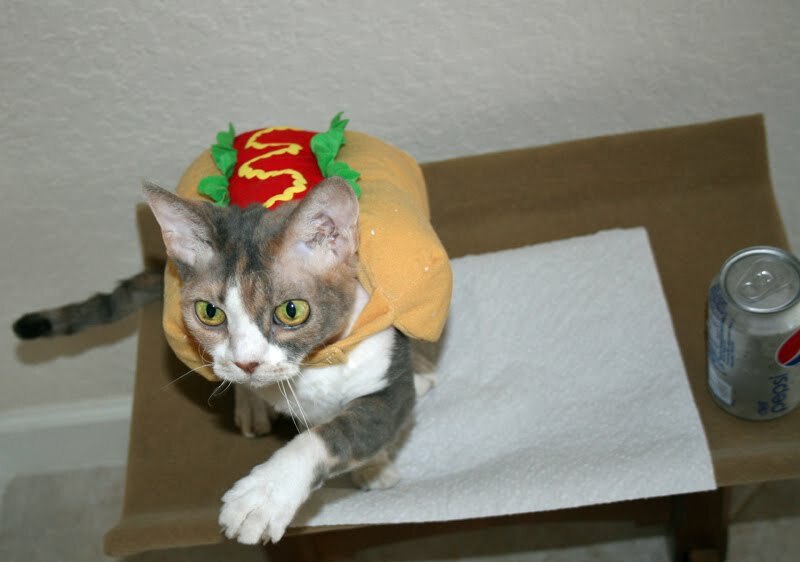 Love the hot dog suit. There's a taco suit that I want to get for Ricky some time. Oh Daisy you be careful. That might be dangerous walking around with a hot dog on your back. We know our Mom loves hot dogs. Hope no one takes a bite out of you. We love that outfit though. Just where are the fries?? Take care and try to stay cool. 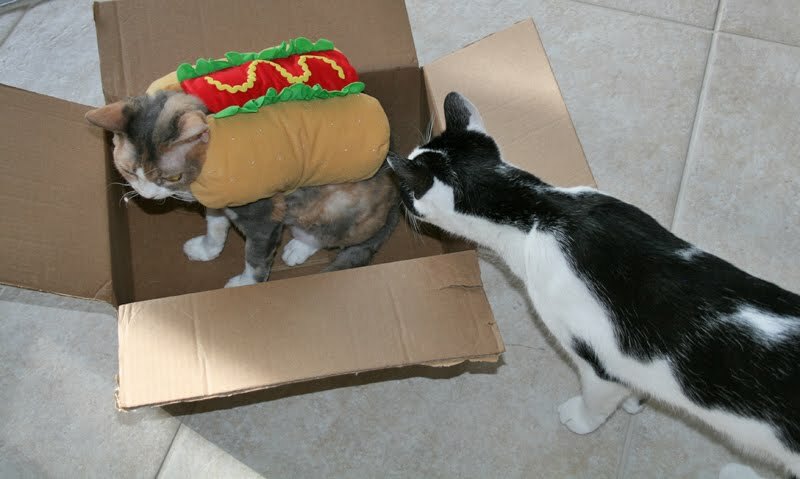 ♪You're a Hot Dog♪...no wait...this is not Rocky Horror Picture Show? that was the best relish joke ever. That is a cute little outfit! Daisy, you look delicious! Are you Kosher? You could make any costume look good, Daisy! Gosh, I am kind of hungry, better go have a snack. Look out, Daisy! You look so good, Harley might take a bite! You are such a cute little morsel! Do you have a bannaner outfit too? You could model that in honor of Pixie. Daisy, are you going to the dogs?! Oh Daisy, cute enough to eat! Please can I have a hot-dog to go? Daisy I have never seen a costume like that look so good! That is just too cute and yes, you look good enough to eat! You made our Mommy's day, Daisy! Daisy, don't you wish there was a chicken sandwich costume? Awesome costume! You are doing the best job modeling it, and you are so patient. Don't let Harley eat you up! MOL! You look adorable, and very frisky in that, Miss D.
Well that is an interesting outfit! 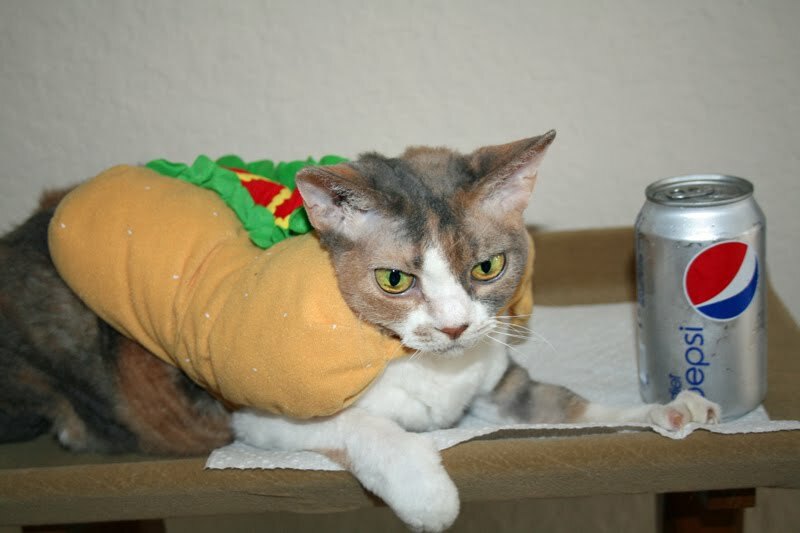 We wouldn't want to eat you though, because you are a cat, and not a hotdog. You look good enough to eat!!! Daisy, we want to eat you all up even when you are not wearing a hot dog suit! Purrs. Daisy I would of sworn that you were a Coke Kitty. I'm loving your very punny humour, today! 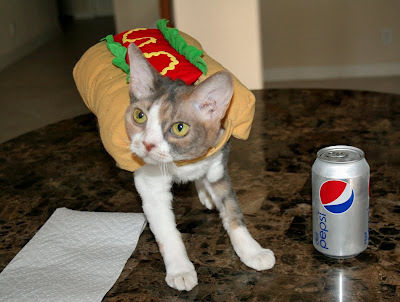 The PAWSibilities with hot dogs are almost infinite. Tell Harley, if he's going to show his wiener, to do it PURRivately. You can get into lots of trouble if you're too 'out there', you know. As usual, you look adorable in anything to happen to put on, Daisy, although I do preFUR you in a dress! Now that's a hot hotdog suit! We're sorry you have to model and don't get any fries!! Fries go with everything,don't they????? Oh Daisy! You make a great hotdog!! Daisy, you have so much more tact than than that crazy brother of yours! Daisy dear, you're just too cute for words! 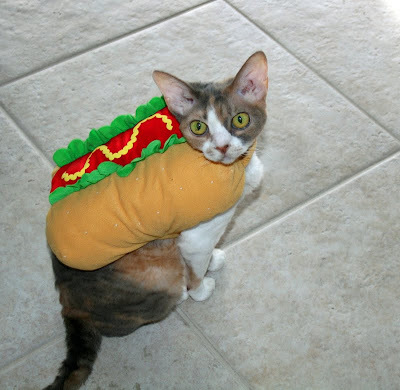 OMC Daisy you are the most DELICIOUS looking hot dog...EVER!!!! Daisy, Daisy, Daisy! That is hot! You are such a cute girl. You and your family, please have a good weekend. you make a very cut hot dog Daisy. I never sausage a cute kitty! OMC! What an outrageous outfit! Is it really made fer cats or did Mom adapt something ta fit you? Oh my goodness, you are such a cute hotdog!! I love your suit very much. I think you should get fries! You are a very hot cat! Oh no! We hope Harley doesn't try to eat you. Oh my goodness, Daisy - I've seen you in a lot of wacky outfits but this really takes the (cat) biscuit! Ha! Ha! OMC that's the funniest outfit we've seen yet! This is just such fun. I have to giggle Harley does such fun and silly jokes! Gloman LOVES hot dogs. I'm afraid I'd be mistaken for lunch with that costume! My mom had to actually go and looks at Harley's Wiener!!! Ha! Ha! Ha! Be careful yoo don't get eated up 'cos yoo look very tasty! we must say hot dogs are delish. (¸.•´ (¸.• ♫ ♪ Forget the fries, I want to know if the happy meal comes with a toy? Huh? Huh? Too cute!! Oh my! You are the cutest and we love your suit! Yummy!